Singapore – Peter Tang Joo Yong knew that getting caught for speeding would bring in many more charges because he was driving under disqualification and had a full record of driving offences. Nonetheless, he still pushed his luck and tried bribing the officer and when that didn’t work, he went for assault. On February 13, 2019 (Wednesday), 73-year-old Peter Tang Joo Yong was sentenced to 14 months and ten weeks in jail along with a S$1,300 fine by the State Courts for attempted bribery and another four offences. He was also banned from driving for life. For offering a bribe, Sgt Yap got his handcuffs out to arrest Mr. Tang and asked for the latter’s driving licence. 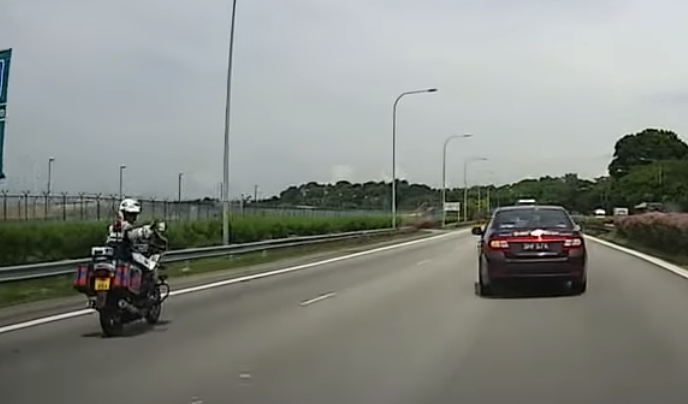 The offender, who did not want to be arrested, kept walking back and forth beside the lorry and used his right elbow to land a blow on the officer who tapped his shoulder and commanded him to stay put. After hitting the officer, Mr. Tang dropped on his knees and pleaded not to be arrested while admitting that he did not have a valid driver’s licence. After Sgt Yap informed the man that he would be arrested for bribery aside from his traffic-related offences, Mr. Tang stood up and shoved the officer’s chest and shouted that he was old and should, therefore, have fewer charges. The assault led to Sgt Yap losing his footing and landing on the grass patch of the road shoulder. Meanwhile, Mr. Tang continued to resist as the officer tried to handcuff him. On October 16, 2017, Mr. Tang permitted another person named Manoharan Sivanatham without a valid driver’s licence to drive his vehicle which is an offence under the Road Traffic Act. Back in 1977, he was caught driving with an expired driver’s licence and failed to insure a motor vehicle against third-party risks. His penalty was a fine of S$400 and a ban from driving for a year. In 1990, he was apprehended for driving without a licence, driving dangerously and other offences. With another year of being banned and a sentence to years of preventive detention, Mr. Tang still did not learn his lesson. Ten years later, he was caught twice for driving under disqualification among other charges. He was jailed for a year, fined S$800, and banned from driving for ten years. Caught again in 2012 for driving under a ban, he was fined another S$800 and spent eight months in jail. This time, his disqualification was extended to his lifetime. The Corrupt Practices Investigation Bureau (CPIB) commended Sgt Yap for his integrity in refusing corrupt acts while the Singapore Police Force (SPF) reiterated that it maintains a zero-tolerance policy to those who hider officers from doing their jobs and toward any acts of violence against them.